Today is my friend Melinda's birthday (Happy Birthday, Melinda!). I knew I was going to see her Saturday so I decided to bake a cake to take to her. 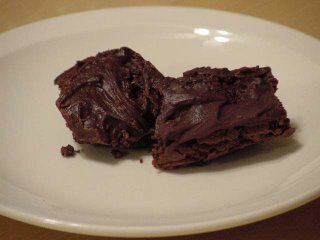 I had some buttermilk left over from the gingerbread I made last week and I had just finished the chapter on chocolate cakes in Laurie Colwin's More Home Cooking, which just happened to have a recipe for buttermilk cocoa cake. It sounded so good I thought it would be the perfect cake to make. This is how it came out. The batter was thick and rich and the cake cooked up light, but solid. Melinda was kind enough to share it with us at the shop yesterday after I gave it to her, and if I do say so myself, it was rather good. Light, not too sweet, loaded with that deep dusty cocoa flavor. It's supposed to be one of those cakes that gets better every day. I definitely plan to test that out soon. I'll get back to you. Melinda's friend Beth had invited some friends over for a dinner to celebrate both Melinda's birthday and that of another friend, who's birthday was a couple of weeks ago. So after spending the day at the shop we hopped on the bus and rode over to Beth's house. She has a beautiful place full of wonderful knick-knacks, art (some by Beth, some by others), all things dog including Romeo, the sweet, loveable, most beautiful dachshund I've ever seen. Beth is a wonderful cook. After enjoying a beautiful arrangement of hors d'oeuvres which included a delicious cheese, figs, dates, caper berries (more on those later, I think), olives and crackers, we sat down to a wonderful chicken tagine with couscous. Over the course of the meal the conversation got so engrossing and lively that the salad course was completely forgotten! But that was ok, because it left more room for dessert. This is all that's left of the more substantial amount I brought home with me last night. Even though I knew I wanted to take a picture of it, I couldn't stop nibbling away at it. It is one of the most delicious cakes I've had in a long time. 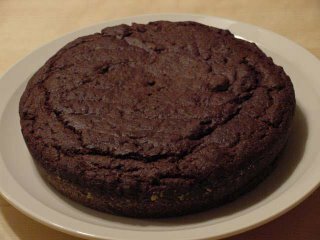 Beth told us it's made mostly with ground almonds and very little flour, and some port that is reduced to three tablespoons. She served it with whipped cream and mangoes and it was the perfect combination of cream, mango, and rich creamy chocolate. There was the most lovely little bite of a tang that hits just before you swallow, I suppose from the port. Both recipes came from Julee Rosso's Great Good Food. I think I'm going to have to get my hands on that book. Beth said she stayed at their bed and breakfast and it was heavenly. If the two dishes I had last night are any indication, I can believe it. As for the Gingerbread, I was able to ration it out over five days (really!). It got darker, richer, moister, and spicier each and every day. To these ingredients add buttermilk, vegetable oil or butter, and vanilla. Mix. Turn batter into the pan, bake the cake in the middle of the oven for 30 minutes, or until a tester comes out clean, and let it cool for 5 minutes before turning it out of the pan. *I only had a 9x1-1/2" cake pan and it came out fine. I can vouch for both cakes. Debi mentioned that hers was supposed to be better over time (within reason!) and it actually was even better yesterday...and will be today I'm sure!